Held as the highlight of the 4 day long annual British St. Leger Festival, the St. Leger Stakes flat race is a group 1 open for 3 year old colts and fillies which run a distance of 1 mile, 6 furlong and 132 yards at the left handed turf Doncaster racecourse when the colts carry a weight of 9 st and the fillies carry 8 st 11 lb. The St. Leger Festival and the St. Leger Stakes race are held at the beginning of September every year when the St. Leger race is the final part of the horse racing events set called the English Triple Crown following the 2,000 Guineas and the Epsom Derby and is also considered to be the final part of the Fillies’ Triple Crown, following the 1,000 Guineas and the Epsom Oaks. The race is Britain’s oldest among the five British Classic Races and was established in 1776. Winner of the St. Leger Stakes receives a purse of £500,000. The St. Leger is named after Anthony St. Leger, an army officer and diplomat who lived near Doncaster and was the descendant of the well known St. Leger family. Having a history of breeding and racing horses in the Park Hill estate at Fireback and with the help of Charles Watson-Wentworth, 2nd Marquess of Rockingham, St. Leger established a 2 mile race intended for 3 year old horses on the Cantley Common at Doncaster where the first race, yet to be named St. Leger Stakes, was run for the first time on 24 September 1776. Winner of the first St. Leger race was the Marquess of Rockingham, winning with an unnamed filly which was later given the name Allabaculia. At first it was suggested that the race will be named after its host, the Marquess of Rockingham, as the Rockingham Stakes, but the Marquess denied the offer and suggested it would be named after its founder, Anthony St. Leger. A year later the race was moved to its current location in Town Moor. The race was of no national interest until a horse named Champion registered the first Derby – St. Leger double. Later on the race was shortened to a distance of 1 mile 6 furlong and 193 yards which is more or less the distance it is being run today. In 1853 the Horse West Australian was the first to ever complete the match for the English Triple Crown. The race location was altered many times during the WWII and in 2006 when Doncaster underwent comprehensive redevelopment and the race was held at York. The St. Leger became a role model of a race for other similar races names after the original race. These races are the Irish St. Leger, Prix Royal-Oak, Deutsches St. Leger and St. Leger Italiano. The St. Leger Festival and St. Leger Stakes are celebrated every year in September and are a profound marking in the British Social Calendar. 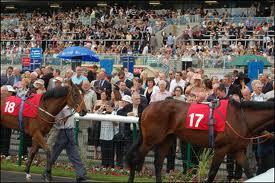 The St. Leger Festival is a 4 day meeting when each day holds a 6 races and a different theme. Its popularity is immense and many racegoers and bettors book tickets and hospitably months in advance. It is almost safe to say the St. Leger Festival is more popular than it was in the past and that every year more and more horse racing enthusiasts discover the thrill and charm the St. Leger Festival harbors with its highlight race the St. Leger Stakes.